Doesn’t Karina look beautiful again? Last night, the dancing pro of Dancing With The Stars spoke and presenting an award at the 15th Annual Golden Trailer Awards at the Saban Theatre in Beverly Hills, California. You can view more pictures of her and this event at Getty Images. A nice wake up for Jim! 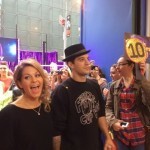 Dancing With The Stars Mark Ballas has been making the rounds promoting his new “Get My Name” single this week. Yesterday, he did the Home And Family show on Hallmark. You can watch him perform a stripped down version of his new single “Get My Name” at this link (does he not have an awesome falsetto or what?). He also gives them an update on the shoulder injury that he sustained while rehearsing for the finals with Candace Cameron Bure. He also discusses the mental and physical strength required to be a serious contender for the mirror ball trophy. Don’t miss it! Last night, Derek and Julianne Hough premiered their “Move Live On Tour” in Park City, Kansas. Twitter is alive with excitement and full of raving reviews. Below are just a couple of videos from the show. 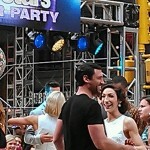 You can watch Derek and Julianne dance in the opening number. Also, Derek and the cast dance to “Holy Grail”. Thanks to NIckJonasluver443 You Tube for these videos. 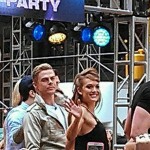 For lots more coverage on the tour including a new interview with Derek and Julianne, a “Move” single download by Derek, more videos, and photos see Pure Derek Hough. If you haven’t got your tickets yet, see Live Nation. Awww, how about this dress?? Last night, Dancing With The Stars Karina Smirnoff worked the red carpet at the Los Angeles Premiere of ‘Maleficent’ at the El Capitan Theatre in Hollywood, California. For more fabulous shots, see Getty Images. So pretty! Below is a video too…. Such good ratings news for Dancing With The Stars. In it’s final week, all three shows placed in the top three. Below is more from the Washington Post via Nielsen’s TV Ratings. Too fun…especially for how it beat The Voice and American Idol like it did. 1. “Dancing With the Stars” (Monday), ABC, 15.66 million. 2. 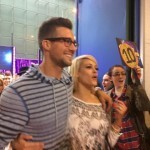 “Dancing With the Stars” (Tuesday), ABC, 15.07 million. 3. “The Voice” (Monday), NBC, 11.7 million. 4. “The Voice” (Tuesday, 9 p.m.), NBC, 11.69 million. 5. “Dancing With the Stars: Road to the Finals,” ABC, 11.64 million. 6. “American Idol” (Wednesday), Fox, 10.53 million. 7. “Modern Family,” ABC, 10.45 million. 8. “Survivor,” CBS, 9.55 million. 9. “The Big Bang Theory,” CBS, 9.09 million. 10. “The Middle,” ABC, 7.85 million. 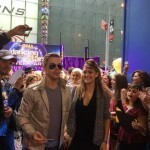 DWTS Season 19 Watchout: Will Sara Evans Return To Dancing With The Stars? Thanks to Nathan’s find via Codebear, we have our first casting rumor for Dancing With The Stars Season 19. It appears Sara Evans wants to give the show a go for a second time being she had to drop out the first time. She talks all about it on The View.